Review: Thai Essence is a new restaurant in West Lafayette, owned by the same people who own Basil Thai in Chauncy Village. This one isn’t so close to campus and is classified as more “upscale” so I was really excited to try it out. I would like to begin by saying it was the best Thai food I’ve ever had in my life. Seriously, stop reading this and go eat there. Now. What? Why are you still reading this? Okay, okay, if you must have a review. 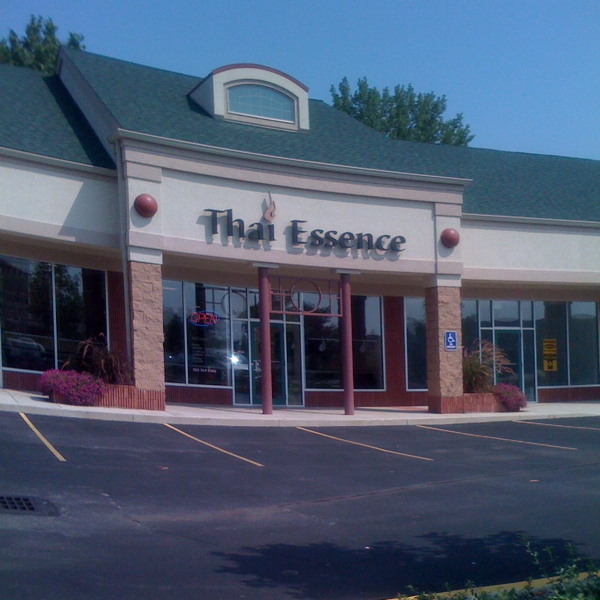 The restaurant is situated in a nice little strip mall on the west side right off Sagamore Parkway on Win Hershel Blvd. It was classified as “upscale” and I was not disappointed. The restaurant was lovely and exceptionally clean. The tables were neatly arranged and the chairs were comfy and made of leather (or faux leather, I’m really bad at telling the difference.) Unlike other restaurants, this one was bright and cheery, with lots of natural light filtering in the windows. It’s definitely upscale, but not at all pretentious. Very classy. It wasn’t busy when we arrived, so we were seated immediately and given menus. The menu offered meals that included curry, a large selection of rice meals, and a smaller selection of noodle dishes and even some desserts. My only disappointment was that there were no appetizers on the lunch menu. I am a sucker for appetizers. I ordered the Pad See Ew with chicken, and my dining companion got the Pad Thai. The food came out quickly and piping hot, clearly freshly made. And if I didn’t make it clear earlier, for those of you who chose to keep reading and not run directly to Thai Essence, is that it was the BEST pad see ew I’ve ever had anywhere. My companion was equally as pleased with his pad thai. The service was fine. The waiter took our order right away, brought out drink refills when he noticed we were low, but did not hover or make small talk. Quiet, but attentive. This is definitely a place I will go again. And again. Methods of Payment: Cash or Credit.